what does it mean…and what’s the best natural treatment?. Eczema is a common skin condition that can affect babies, children or adults in any number of ways. The skin can become red, inflamed, dry, cracked, broken, itchy or thickened – particularly in the chest, face, neck and the creases of knees or elbows. Natural Skin Relief for Eczema, Psoriasis & Dermatitis. 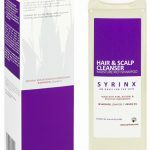 * Includes Sapropel which encourages natural healing. * Non-greasy, quick to absorption, fast acting. * Clinically shown to reduce inflammation, redness and itchiness. * No parabens, steroids, petroleum or chemicals. 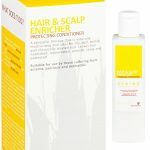 Maximises sapropel, argan and essential oils with natural healing properties, proven to be suitable for those prone to eczema, psoriasis and dermatitis. We have a range of natural soaps and lotions designed for anyone who suffers from eczema and other sensitive skin conditions. 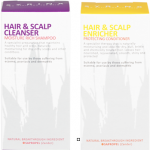 All our products are rich in Sapropel – a natural moisturiser that will nourish, heal and restore dry or flaky skin. So with frequent use, you can enjoy a new life free of sores and discomfort. 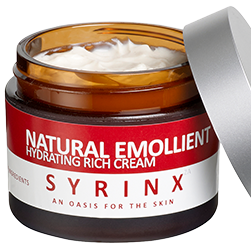 Crucially, our ingredients are natural…so with Syrinx Za, there’s no risk of an adverse chemical reaction. In recent Clinical trials over 8/10 of eczema sufferers tested claimed the cream left their skin feeling soft and moisturised. Each case can be treated, but there’s no long-term cure – if you’re prone to developing eczema, it can flare up time after time. So as an eczema sufferer, the best you can do is treat your skin well. 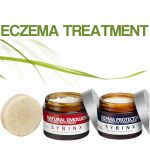 As you’ve probably found, many eczema remedies contain chemicals and artificial additives that can irritate the skin. So instead of healing eczema, remedies often make matters worse, causing discomfort or even rashes. Every morning and night, use the Therapy Bar to deeply cleanse and remove unwanted toxins and chemicals from the skin. Work the bar into a thick lather and wash gently, then pat dry with some strong absorbent material. Tip: for best results, wash with soft water. If you live in a hard water area, use water that’s been boiled in a kettle. 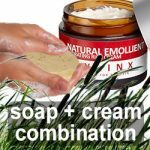 Next, apply the Natural Emollient for Eczema. You should work this in gently, using the finger tips. Repeat this procedure morning and night. 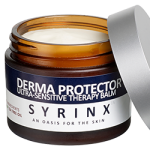 Over time, you should find that this treatment relieves soreness and reduces the symptoms of eczema – especially if you apply the Moisturising Therapy Balm for added protection outdoors. 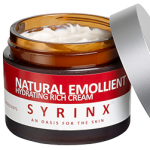 Manage the pain and discomfort of eczema with this gentle, soothing emollient that blends essential oils with the natural healing properties of Zander and Argan. For eczema sufferers, soaps and cleansers can dry and chafe the skin. But this gentle, natural soap will soothe and deep cleanse, removing the toxins that aggravate the skin’s natural oils. The skin creams work well on oily skin or delicate parts of the body – including the face, ears, neck, chest and groin. The balms offer protection from the elements, and work well on dry or cracked skin – especially on the hands, feet, ankles, legs and arms. So you may want to experiment. All our products are clinically proven to be non-irritant, so you can mix and match without risk. It won’t be long before you find the right balance for your type of skin. I have suffered with eczema on my hands for over 40 years. During this time I have tried a number of products, often claiming to be “the miracle cure”. Often they worked but only for a while and usually it all got worse when I stopped the treatment. I was given a sample of your product and started to use it straight away. Initially the skin dried out further and then gradually it began to re generate and heal before my very eyes ! 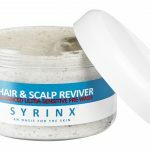 It was quite amazing and I am totally convinced of its healing properties and will strongly recommend it to anyone with this problem ! 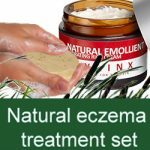 I have found it excellent and in particular my son who has chronic eczema has been using it and has had very good results.